Elf John Tamaki, left, and Aaron Aoki accompanied Shogun Santa as he toured Little Tokyo on a bicycle-powered sleigh last Sunday. Santa will return to Weller Court Dec. 13, 14, 20, and 21, weather permitting. He made his initial appearance in November 1986 as the star of the Little Tokyo’s Children of the World Parade, and now the Japanese American community’s version of the beloved Christmas patriarch is back. Enter Shogun Santa 2.0. Thirty years ago, the parade wound its way from Third and Central to Japanese Village Plaza. At the time, JVP was Little Tokyo’s newest development, the brainchild of Korean American architect David Hyun, who also designed the plaza’s iconic yagura tower at the north entrance on First Street. True to its theme, the parade drew participation from children’s groups, drill teams, and Boy Scout troops ranging from elementary to high school age, many wearing costumes they had made out of paper and glitter as class projects. 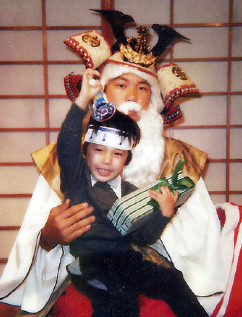 In the 1980s, Shogun Santa was a fixture in Little Tokyo’s Japanese Village Plaza. Sometime in the early 1990s, Shogun Santa disappeared. The character was revived in 2013 by the Little Tokyo Business Association (LTBA) to help promote holiday shopping and attract new visitors to the area. 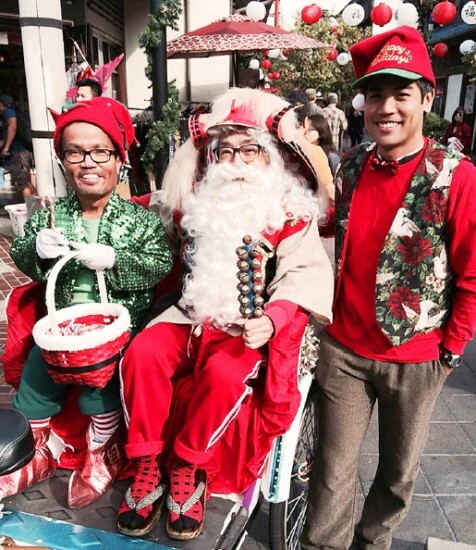 On Sunday, Shogun Santa, portrayed by Rodney Kageyama, returned to Little Tokyo, touring the area in a bicycle-powered sleigh, greeting visitors, and posing for photos at Weller Court along with his sidekick John Tamaki. In addition, a balloon artist and face-painter were on hand for children. All was provided free of charge by the Little Tokyo Business Improvement District. The Shogun Santa courtyard attraction is scheduled to return to Weller Court, Second and San Pedro streets, on Dec. 13, 14, 20 and 21, weather permitting. For additional information, contact LTBA by emailing [email protected] or calling (213) 880-6875.